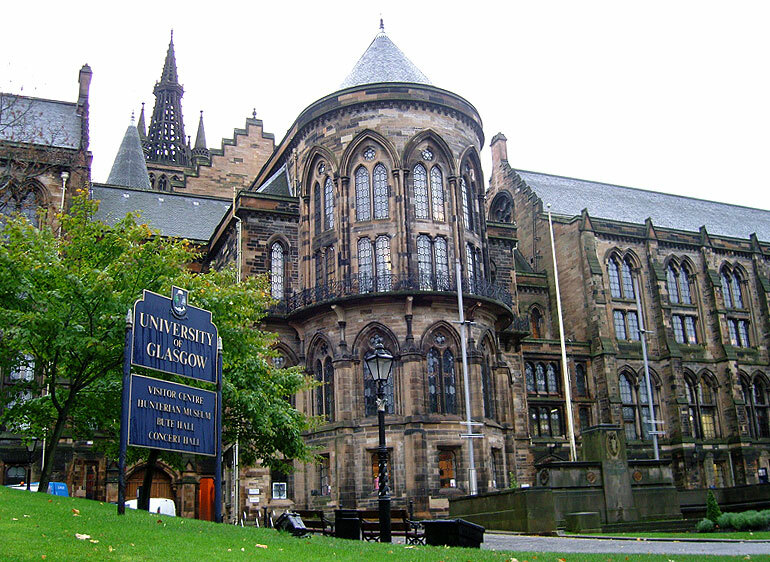 The Hunterian Museum at the University of Glasgow. Photo by Øystein Horgmo © All rights reserved. This weekend I was visiting a friend in Glasgow and found the time to see the Hunterian Museum. It has a permanent exhibition called “A Healing Passion“, dedicated to the impact of Glasgow and Western Scotland on medicine. The exhibition is divided into seven different subject areas: Anatomy, Pathology, Surgery, Public Health, Forensic medicine and Science, Obstetrics and Tomorrow’s Medicine. The latter, however, does not open until next year. The core of all the subjects are items from the wast anatomical and pathological collections of William Hunter (1718-1783). The elder brother of famous surgeon John Hunter, William was first and foremost an anatomist and obstetrician. In addition to the items he collected as a part of his career, Hunter was also an avid collector of coins, books and art. All of which form the basis for the Hunterian Museum & Art Gallery in Glasgow. Not to be confused with The Hunterian Museum at the Royal College of Surgeons of England in London, by the way. That museum is based on his brother John’s collection. Something that ran in the family apparently. 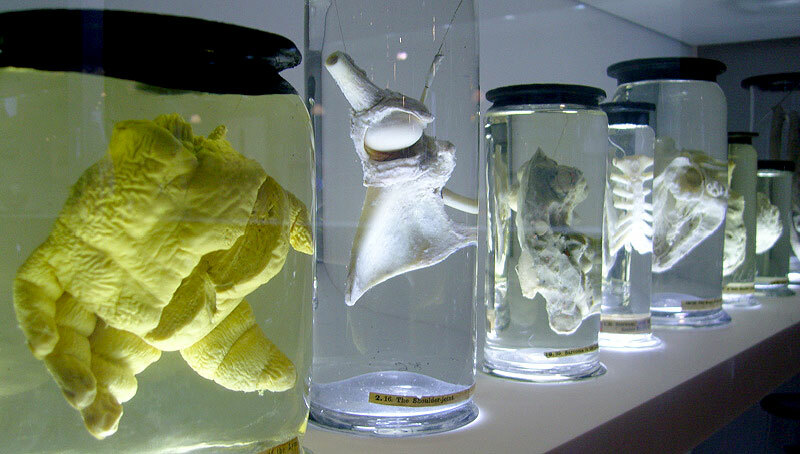 Specimen from William Hunter's pathological collection. Photo by Øystein Horgmo © All rights reserved. The exhibition is arranged in a simple but elegant way. All the different items are accompanied by a computer screen. By pushing a large red button one could read about the item on display and the history surrounding it. I’m a restless person, and when I’m visiting museums I tend to head directly for the most visual and immediate parts of the exhibition. I have no patience for large posters crammed with text. This exhibition however, is visual all the way through. They have made a selection of items and use them as a physical basis for a bigger picture, and not the other way around. As a visitor you first see the item on display, for example Joseph Lister’s famous carbolic spray, and then have to actively push a button to get the story of antisepsis. The interesting item itself motivated you to seek more information. I liked that. Glasgow truly has a medical legacy to be proud of. Joseph Lister, the father of sterile surgery, worked the theatre at the Glasgow Royal Infirmary. William Macewen, pioneer of bone grafting, neurosurgery and endotracheal anesthesia (to name a few), did his ward rounds at the Western Infirmary and the Royal Hospital for Sick Children. John Boyd Orr, who won the Nobel Peace Prize in 1949 for his research into nutrition, was a rector at the University of Glasgow. Ian Donald, who pioneered the use of ultrasound for diagnostic purposes, was professor at the Glasgow Royal Maternity Hospital. The list goes on, and they’re all featured in “A Healing Passion”. A visit is highly recommended. William Hunter’s book “Anatomia uteri umani gravidi” (The anatomy of the human gravid uterus exhibited in figures), published in 1774. Photo by Øystein Horgmo © All rights reserved. Display stand with interactive screen and anatomical models. Photo by Øystein Horgmo © All rights reserved. A skull with several tumors. Photo by Øystein Horgmo © All rights reserved. The lymphatics of the intestine visualized by injecting mercury. Photo by Øystein Horgmo © All rights reserved. A model of a staphylococcus aureus bacteria. Photo by Øystein Horgmo © All rights reserved. A nineteenth century lithotrite and a partially crushed bladder stone. Photo by Øystein Horgmo © All rights reserved. A model of the operating table used by Joseph Lister. Photo by Øystein Horgmo © All rights reserved. A hand amputated for epithelioma. Photo by Øystein Horgmo © All rights reserved. A preparation of the placenta at full time. Photo by Øystein Horgmo © All rights reserved. Photos by Øystein Horgmo © All rights reserved. Larger versions of the photos can be found on Flickr. Thanks to the museum for allowing me to take photos of the exhibition. I’m an academic physician (formerly at Harvard and Stanford) who found your blog while looking for the best health writers. I think your writing is great! I would like to feature you on Wellsphere, a top 10 health website that has well over 2 million visitors monthly. If you would like to learn more, just drop me an email. 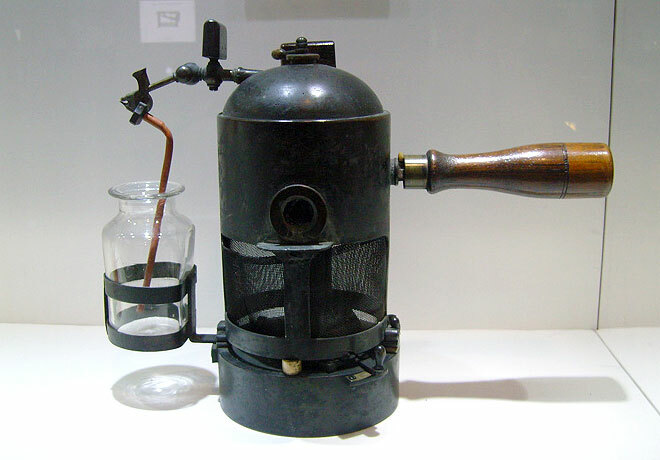 Interested in obtaining photo of Joseph Lister’s carbolic spray for our publication. Could you contact me, thanks! Jennifer: Check your email for reply. You are currently reading A Healing Passion at The Sterile Eye.